I’m becoming increasingly intrigued by these sorts of things. Like how often do cars just ram into houses? Is it a traffic crash? (i.e. will there be an ACR? I am tagging it as a non-traffic just to remember to go back and check). The print story also said “It wasn’t clear if the man was cited”, and “Another neighbor said she had a previous issue with the driver of the van. 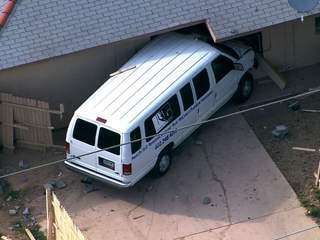 Dorothy Coverdale said the driver fell asleep in the van after parking in front of her driveway”. Driving is a privilege, remember? No one was hurt but it’s clear that’s just a matter of coincidence — the van was completely out of control. Previous PostStreet Highway Sidewalk Roadway Shoulder DefinitionsNext PostMore about shoulders; this time golf carts. There’s no reason to cite the driver, he was not responsible. It was the van.